Britain imposed socialized healthcare in 1948 with the creation of the National Health Service [NHS]. Then Labor Minister Dr. David Owen predicted, “We were going to finance everything, cure the nation and then spending would drop.” This was pure blind hubris. Sixty-four years were wasted in an attempt to prove that socialized medicine could work. So far, it has been an utter failure. It seems at least one person in Britton is beginning to see the light. The current Prime Minister David Cameron, along with some conservatives, are suggesting to outsource healthcare to the private sector circumventing the NHS. It is cheaper, higher quality and faster. 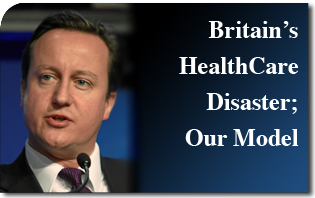 He added that the British government, “unlike the Obama administration, is hearing the warnings, identifying its greatest vulnerabilities and trying to race ahead of the deluge.” So why are we following their failed attempt of socialized healthcare? A few years ago in Canada, Pipes’ mother could not get a simple colonoscopy scheduled for several months in spite of excruciating abdominal pain. When her mother started bleeding, she was rushed to the emergency room and finally given the colonoscopy, which indicated colorectal cancer. At this point it was too late for treatment and she died shortly thereafter. This is a tragic example of how socialized healthcare denies the end user of quality treatment and keeps costs down by rationing medical services while it passes on exorbitant administration fees to taxpayers. If efficiency, perfection and overall quality are not the driving force behind socialized healthcare, what ideology could be the motive behind such a decision — other than to make everyone equally miserable. Nearly 1.8 million Britons are waiting for hospital or outpatient treatments at any given time. In 2002–2004, dialysis patients in the U.S. waited 16 days on an average for permanent blood vessel access, 20 days in Europe and 62 days in Canada. In 2000, Norwegian patients waited an average of 133 days for hip replacement, 63 days for cataract surgery, 160 days for a knee replacement and 46 days for bypass surgery after being approved for treatment. Studies have shown that short wait times for cataract surgery produced better recovery rates, prompt coronary artery bypass reduced mortality and rapid hip replacement reduced disability and death. Currently, only 5 percent of Americans wait more than four months for surgery, compared with 23 percent of Australians, 26 percent of New Zealanders, 27 percent of Canadians and 36 percent of Britons. This accounts for a 700 percent increase in wait times comparing the U.S. to the UK. Non-elderly, white, low income Canadians are 22 percent more likely to be in poor health than their U.S. counterparts. It appears likely that the personal characteristics that ensure success in a free market economy also enhance a degree of personal success even in overly bureaucratic systems. Unfortunately, socialism destroys the essence of the free market initiative anywhere it is imposed in the futile attempt to force equality and thus, the consequence is failure. Britton’s 64-year-old socialistic healthcare fiasco started in 1948, ours is promised to begin in 2014. This entry was posted in News Commentary and tagged bankruptcy, Bill, Britain, Canada, Care, David Cameron, David Owen, Disaster, failure, health, healthcare, ideological, ideology, labor, medicine, minister, model, National, NHS, Obama administration, policy, President, Prime, Reagan, service, socialized, U.K., White House by Gary Isbell. Bookmark the permalink.